There is only one reason why Bon Jovi came back to Istanbul, “to make the Turkish girls scream.” After a triumphant performance, the band deservedly got what it wanted. Before Friday, the Bon Jovi show was dubbed as “the biggest concert of the year,” and it lived up to expectations, if not crushed them, as the 35,000 people present for the American rock giants’ performance at Türk Telekom Arena would tell you. The set’s opening song was “Raise Your Hands,” which was, in a way, the most perfect way to kick start a stadium show. 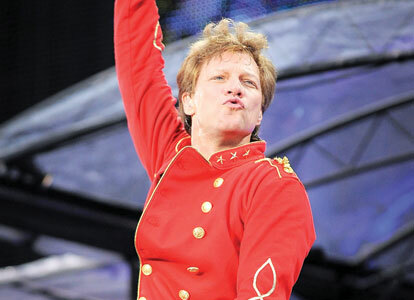 Jon Bon Jovi, the band’s 49-year-young frontman, took a short tour around the stage during the song’s chorus, calling the crowd to do what is urged in the song title. Within the seconds, the crowd started to obey the master and the show was on. If “Raise Your Hands” was a call to arms, then the second number, “You Give Love A Bad Name,” was the air raid. The mass went wild and did what should be done at a rock show: sang along. Actually, Bon Jovi’s back-catalogue is the perfect fit for such an atmosphere. Jon has a knack for writing hooks and those catchy choruses are tailor-made for concert madness. Bon Jovi played almost all of their hits, from the 1980s’ powerful kicks to 2000s modern rock tunes. And they stayed on stage for about three hours, reminiscent of Bruce Springsteen, Jon’s fellow New Jersey idol. It was not only the songs: An eye candy screen and light show also helped.